In his first decade of life Bryan began school life a lively, friendly, outgoing, rebellious character. But because of certain events, and the ever present negative influences in his life, his original personality gradually began to withdraw. In his teens Bryan became withdrawn, frustrated, and jealous. Jealous they had plans, goals, a purpose for when they finished school. Bryan left school at sixteen, highest grade E. Further education was not an option. In his twenties Bryan was living a lie. He didn’t have any passions, he didn’t know what his hidden talents might be, or any idea what he wanted to do. So he did work that wasn’t aligned to his true self. He resented himself, his job, his life, and his lack of ideas on how to change it. Other losers and lost souls recognised a kindred spirit, befriended him and continued to hold him back. Toward the end of his twenties, soul sick, and hitting bottom, he left his negative environment, moved to a new town, and had the first a-ha moment that would start to turn his life around. In his thirties Bryan would gradually discover who he wanted to be, and begin to relentlessly teach himself how to become that person. In his forties he had been thinking about, dreaming about, learning about, and writing books/programs for his future online business. Non stop. At age forty-seven, almost exactly twenty years after his first a-ha moment, he stopped living a lie, and quit his day job to work full time on his own online business. In his teens he began transforming into a quiet, withdrawn, social anxiety personality. In his twenties he lived the thoughts of his teens and drank a lot to repress the constant self-criticism & belief he was worthless, with nothing to offer the world. In his thirties he began to rehabilitate and educate himself after experiencing a breakthrough discovery and a kindling of hope in his late twenties. In his forties, he was riding an ever growing wave of high self-belief, born out of a continued self-education in his thirties. Now with self-belief, confidence, knowing what his talents were, and more than a decade of developing them, he took the ultimate act of self-belief, and quit his job to use them full time. I know all this to be true because that person was/is me. I use my middle name now because when I hear my first name, I associate it with the person I used to be. In that entire timeline, more than twenty-five years of it has been poisoned by shyness and social anxiety. This is a state of mind that happens below our conscious level like a secondary personality that has taken over control. It wasn’t until my late twenties when I discovered something that resonated with me, something I could be passionate about and wanted to master. A discipline that acted like an antidote against, and was the first step in overcoming social anxiety. If you want to know how to overcome being shyness or how to overcome social anxiety, discovering something to be passionate about is like gaining a shield. Something that deflects the full effects of low-self-esteem and self-criticism, giving your original personality some breathing space and the chance to recover and regrow as you build on that passion. For me I had been repressed by social anxiety for about fifteen years before discovering a passion. The imposter personality was well established by this time so it took perhaps another fifteen years for me to reverse most of its effects, leaving me only with scars on my inner world and a driving determination to help save others from losing thirty years of their life like i had. 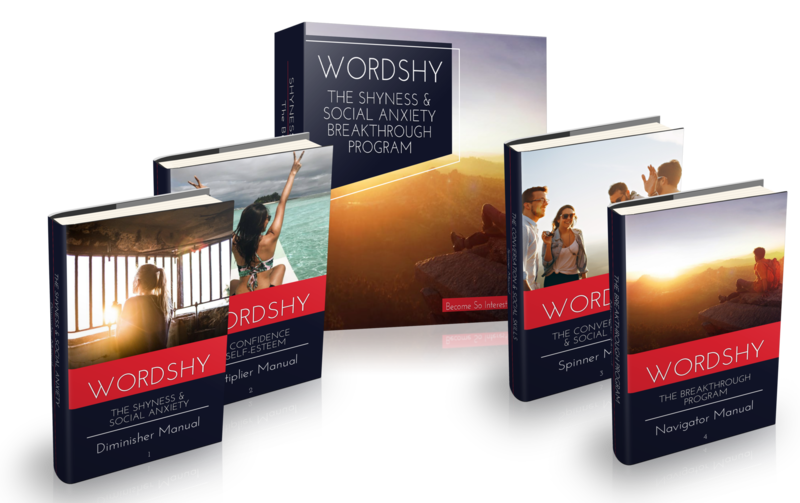 If you want to know how I can help you effectively and fully remove your own shyness and social anxiety imposter personality, take a look at the program I have created for you. Forged out of twenty-years experience and field testing, it's a twenty-five year recovery process, purified and super-condensed into six life-changing weeks.